It’s more than obvious that this Millennium Falcon is not the pile or garbage that we saw in The Force Awakens, nor is it the grimy old ship that we first saw in A New Hope. This Millennium Falcon is nice and clean. But what you will notice in the video, is that it is titled “Lando’s ship.” Because obviously, it belongs to him. Now, the featurette does give us a look at some of the details of it. In it we see Glover explain how the ship functions. We see things like “buttons that light up,” a “Wookiee cookie jar,” “fruit storage,” “low humidity footware storage,” and a variety of capes that can be used for weddings, president’s day, and “in case someone gets cold.” Yes, this ship has everything. No, it cannot be yours at a bargain price. 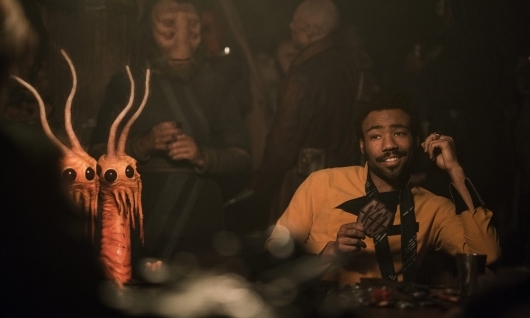 I think the video really speaks to the tone of Solo: A Star Wars Story. From everything that we have seen so far, it looks like it is going to be a very fun film to watch on the big screen. And who wouldn’t want to watch a much younger Han Solo (Alden Ehrenreich) make a name for himself? But that isn’t the only piece of new footage to be released. As aforementioned, Howard was also in a video where he narrates Star Wars: A New Hope in the style of an Arrested Development narration, a bit that he has done for the show. If you’re not familiar with how it goes, well it plays out a little bit like this. It’s a funny bit if you are very familiar with the show. If you’re not, well consider Howard as a detached observer that is narrating A New Hope with a dry sense of humor. Solo: A Star Wars Story also stars Emilia Clarke, Woody Harrelson, Thandie Newton, Phoebe Waller-Bridge, Joonas Suotamo, and Paul Bettany. It opens in theaters on May 25, 2018.